Jimmy was born premature and had hydrocephalus. He had his first surgery before he was a year old and others followed. His death was due to damage from meningitis- pnuemonia developed in one night from a minor cold or flu. Delayed Death Certificate on Ancestry.com website. 1850 Owsley Co. KY Census, HH 58, & 1870 Owsley, Buffalo Prec. HH 9 - 1833. 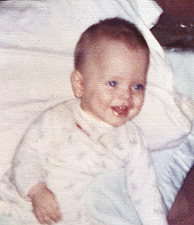 Nickname from Jacklyn Thomas Flannery, g/d of Alpha Flannery & Vincent Thomas. Owsley County Cemeteries MyFamily Website. PAGE: Howell C. Brewer Cemetery. 1880 Owsley Co KY Annotated Census by M. M. Hayes, Dist. 80. 1900 Owsley Co. KY Census, Sturgeon Precinct, HH 231. Golden Combs Ferguson, grt granddaughter of Luther Combs & Sallie Coomer. Jacklyn Thomas Flannery, Hamilton, OH, wife of Oscar L. Flannery. In Owsley County in parents' HH on 1850 Census. Ceremony was performed by Thomas H. Carson, Estill County Court Clerk. Civil War Pension Record of Henry H. Gabbard. PAGE: Affidavit of Frank James, dated 5/11/1889. PAGE: Declaration of Widow, dated 4/13/1889. Claudia Newell, researcher for Ameil Thomas, son of Millard F. Thomas and Lemer Stubblefield. 1810 Madison Co. KY census. 1858 Extracted Breathitt Co. KY Marriages. Father: John M. PETERS Sr.
1880 Owsley Co KY Annotated Census by Margaret M. Hayes, Dist. 80.